Movie is based on a short story of the same name by Poornachandra Tejaswi. Tabarana Kathe is the story of Tabara Shetty, a government servant in the ranks of a watchman. Tabara Shetty serves the government till his retirement. He is a dedicated worker and respects the system that sustained him for so long. But problems emerge after his retirement. Tabara never gets his pension money. In his failing old age, Tabara approaches the officials he had served. Except for a few sympathisers, nobody helps Tabara get his pension. Matters worsen when his wife and only companion falls sick with diabetes. She has a sore foot which turns to gangrene. Tabara tries all means to get his pension to treat his wife. After a few months, his wife dies. The pension money arrives after that. Tabara curses his higher officials and the system which ruined his life. Film historian Theodore Bhaskaran picked Tabarana Kathe in Rediff.com's ten best Indian films of all time. When Tabara fails to manage his wife's operation, in a moment of desperation, he goes to a local butcher and asks if he would amputate his wife's leg. This intense scene was shot brilliantly. 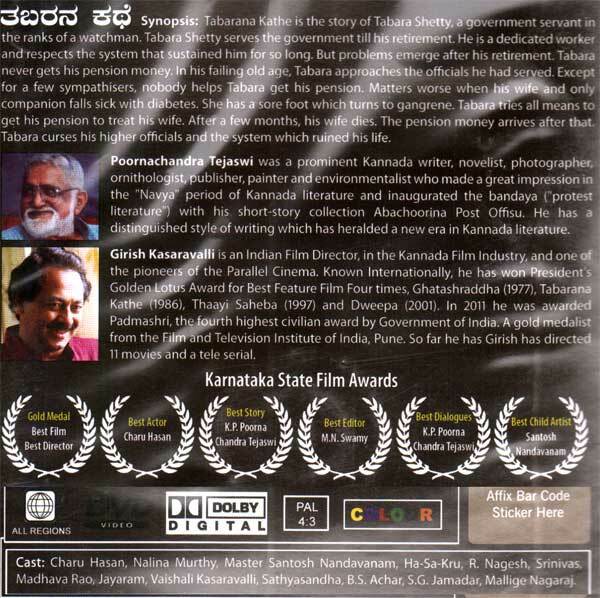 The climax was another highlight as in all Girish Kasaravalli's films. Tabara finally receives his pension. But everything is over. His sole companion has left this world. Standing in front of his past office, Tabara shouts at the office staff and holds them responsible for his wife's death. Tabarana Kathe was screened at film festivals including Tashkent, Nantes, Tokyo and the Film Festival of Russia.